I wanna be on school vacation - it's times like this that I almost wish I was back working in the kitchen at the school so I could have all the same vacations as my son again.......I said almost! But more than anything I wish I could just go on vacation....somewhere sunny and WARM. Actually hot, somewhere hot would be better......ahhh, I can't wait for summer! Preheat oven to 350, and spray an 11x7 baking dish with cooking spray. Mix dry ingredients in large bowl. Combine the milk, sugar and eggs with the melted butter. Stir butter mix into the dry ingredients until well blended. 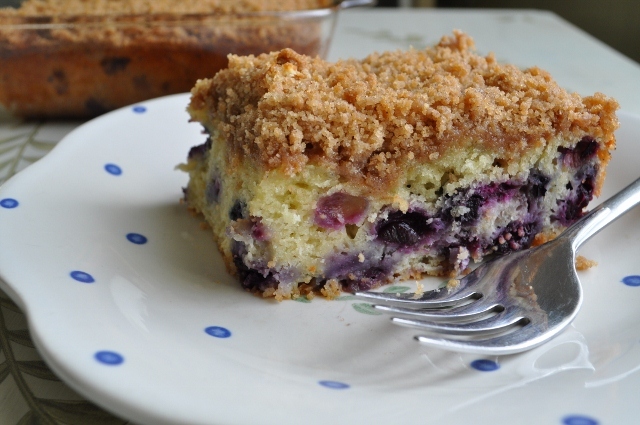 Fold in blueberries, and pour mixture into pan. Sprinkle the topping (see recipe below) over top and bake for 50-60 minutes, or until toothpick in the center comes out clean. Topping: Add 1 cup brown sugar, 2/3 cup flour, 1 tsp cinnamon, 1/4 cup cold butter to bowl of food processor. Pulse until mix becomes crumbly. Looks so yummy! I`m in love with blueberries! What size pan do you use? Looks fantastic! Thank you so much for your comment - I love hearing what people think after they try my recipes :) This coffee cake is always a hit when I make it as well, and it barely lasts 2 days in my house! Hi Joy! Thank you so much for allowing me to use your recipe. I'll pin it on my, "Let's Bake A Cake" Pinterest board and I will enter your blueberry coffee cake at our local fair this year. I will gladly let you know what the outcome is, here, on this post. Our local fair opens anually on July 3 and I will let you know the results a.s.a.p. Thanks again!! Hi Joy! I've returned from a busy first day at our local fair. The exhibits opened at 4 p.m. today. Your blueberry coffee cake I entered, was awarded a 2nd place ribbon in misc. cake class. They did not have a class just for coffee cakes. I also won a blue ribbon for a german chocolate pie, 2nd place for banana bread, 2nd place for gingersnap cookies and a blue ribbon, champion ribbon and best of show ribbon for pumpkin whoopie pies. Not bad considering, I only entered those five foods. Thank you again for sharing your recipe with me! It was an exciting day! I made this recipe and it was quite delicious! The only thing I did different was use salted butter (that's all I had) and did not use the pinch of salt. I also added a decent splash of vanilla extract to the butter/milk mix. This was awesome and my family loved it! Thank you!